Highest quality digital audio up to 192kHz/24bit S/PDIF audio format available from your PC, MAC or Linux computer. Very low jitter oscillators, asynchronous transfer on USB. Compact size (2x2.2x10.2cm) with hi-end performances hiFace Two USB interface has been conceived to further improve the performance and ease of use of the acclaimed and award-winning hiFace. 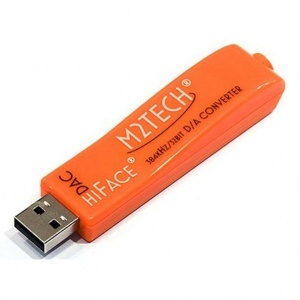 HiFace Two input format is a data stream signal with sampling frequency/resolution up to 192kHz/24bits, compliant to USB Audio 2.0 specifications, available from a PC, MAC or Linux computer USB port. A very high quality S/PDIF stereo audio output signal is available from hiFace for your Hi-Fi system DAC (Digital to Analogue Converter). HiFace looks like a small USB pen drive, featuring a very compact size. Internal very low jitter oscillators allow for playing 192kHz/24bits audio files that feature the best signal quality. hiFace Two is even easier to use than the hiFace. No drivers are necessary with either Mac and Linux computers, while a single standard driver is required for Windows computers. While the old hiFace offered Direct Sound, Kernel Streaming and WASAPI transfer modes, hiFace Two adds ASIO mode to enable interfacing to pro players and software tools. hiFace improves the audio performance over the hiFace by a new output circuit compliant with S/PDIF levels, linear regulators in place of switching ones and a click less operation even when skipping tracks.